If you’ve never had the incredibly nasty displeasure of experiencing heat stroke, take it from us you really don’t want to. Heatstroke is the opposite of hypothermia (caused when the body’s core temperature is too low), but it doesn’t generally receive the same level of respect from Canadians. If you tried to go out in a blizzard with runners and no coat, your mom or spouse would wonder if you were crazy. Those of us living North of the 49th parallel understand the killing power of cold. But heat can kill too. In 2015, India experienced one of the worst heat waves of all time. Temperatures neared 50 C, and over 2,500 people died that May from heat exposure. By June, the heatwave had moved from India to Pakistan. Temperatures crawled even higher, and another 2,000 deaths were attributed to heatstroke. We’d like to hope our readers aren’t the sort of people to think, “Yeah, but that was in developing nations. Things like that don’t happen in first world countries.” But on the off chance, let’s not forget that in 2003, Europe was struck by a heatwave of its own. Drought caused mass crop failures. France experienced nearly 15,000 heat­ related deaths, and a study in Spain suggests the heat was responsible for a further 13,000 death there. In all, the heatwave struck 10 European countries and was responsible for more than 70,000 dead. So when we say that heat kills as well as cold, believe us. So now that you know sunstroke can kill, it’s important to know how. If you think you can deduce the cause of death from the name, I’m afraid you’ll be heading the wrong direction. Sunstroke is a misnomer, and its deaths are not caused by any blockages or hemorrhaging in the brain. Instead, heat stroke is the result of internal organs overheating. Think of it this way, when you fry an egg, some of proteins change from clear to white and other changes cause the yoke to become solid. The heat from the pan permanently alters and denatures the egg’s chemical makeup. Heat stroke works similarly, except instead of frying up an egg, you’re heating your liver, lungs, kidneys, heart, etc. Now that you understand why heat stroke is not something to take lightly, it’s time to understand how you can prevent it. The most important thing to do is stay hydrated. Water acts like a coolant for the body. Water is able to absorb and hold a lot of heat, so your body uses water to soak up heat from your organs and then sends that warm water to your extremities. Drinking cold water is best! 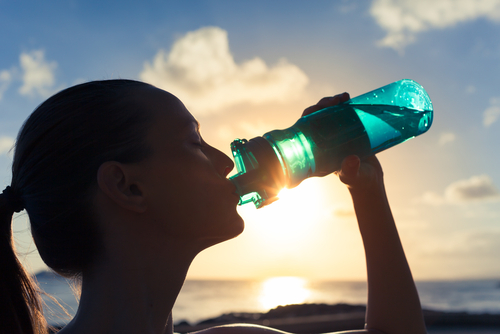 Not only does cool water taste nicer, but you’ll body will use up some of its excess heat to warm the water up. Remember almost all beverages (including coffee!) will help you to stay hydrated and safe from heat stroke. Eating juicy fruits and veggies like watermelon or cucumber also helps! The big exception is alcohol. Alcohol dehydrates the body, so individuals are at a higher risk for sunstroke when they are drinking or hungover. Heat stroke needs to be taken seriously by Canadians. Our summers are only getting hotter and that could mean serious dangers for the elderly, young children, and even those of us in between. You can help yourself keep cool this summer by wearing loose light clothing, staying hydrated, and sticking to the shade. And don’t forget to wear a hat and use sunscreen! From everyone here at Health Risk, we hope you all have a great summer and stay safe!